FishbowlNY was at some of the early upfront presentations this week in New York City, attending both Gannett’s and The Discovery Channel’s events on Wednesday and Thursday, respectively. There were packed audiences at both venues, with Gannett’s presentation being held at the AXA Equitable Center and Discovery holding their event at Jazz at Lincoln Center’s Frederick P. Rose Hall. 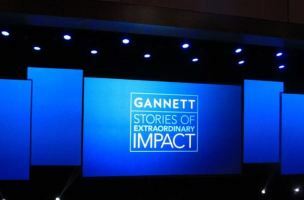 Gannett had a “stories of extraordinary impact” theme, rolling out speakers like best-selling author Mitch Albom and Olympic track and field star Lolo Jones. 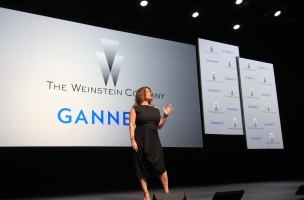 At the presentation, Gannett announced a partnership with The Weinstein Company, giving the film company first-look access to turn Gannett’s local TV and newspaper stories into TV shows and films. Discovery Channel rolled out some of its own heavy hitters, with stars like Oprah and “Long Island Medium’s” Theresa Caputo presenting. Filmmaker Ron Howard also presented, announcing a new short-form, online scripted platform called “New Form” he is partnering with Discovery on. The company also announced a live TV and events push; Discovery and Science Channel will be the exclusive TV homes for a potential moon landing, airing coverage of the Google Lunar Xprize. The $30 million worldwide challenge features private companies and individual teams vying to land an unmanned robot on the moon. 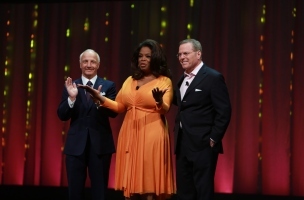 Look for more from the upfronts next week, including CNN’s presentation Thursday.